CCI-India is to launch a three month enquiry campaign focusing on internal migration following its general assembly and study session in Chennai last week. The General Assembly also elected a new national team with Xavier Anthony as president, Glynis Joseph as secretary and Monica Mascarenhas as treasurer. The immersion session was conducted by Fr. 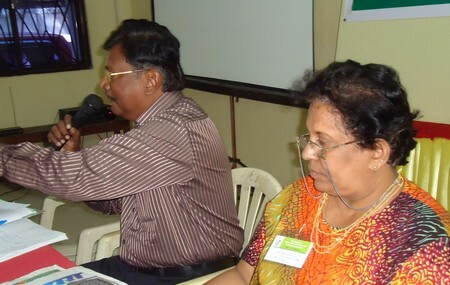 Maschio, Animator of CCI groups in Kanniyakumari and Tuticorin dioceses. M. J. Ruben made a presentation on ‘What is CCI’. Ms Glynis Joseph, Coordinator of the host chapter welcomed and Lazar, Treasurer proposed a vote of thanks. The inaugural session was followed by a welcome dinner. 12th Nov.: The Study on ‘Corruption – in and around us’ brought out new insights and revelations about our own lives, attitudes, mentalities, perceptions and about what is happening in the community. Many proposals came out in terms of acting against this menace. 13th: GA – Business session with chapter reports, National report, financial report, etc. It was amazing to discover that Rupess 260,000 was the income in just 18 months. All this money came from the CCI members and through their efforts from the friends of CCI. Everyone felt that it is possible to develop the movement without having to depend on external sources. This is one of the aspects of the ‘spirituality of CCI’ and we need to develop this ‘culture’. 1. Internal Migration: Inquiry Campaign to be launched on the ‘Living and working conditions of internal migrant workers’ at the all India level which will go on for 3 months. The National CCI will plan further based on the findings. 2. Vatican II @ 50: A 3 year project commemorating the 50th anniversary of Vatican II will be launched in 2012. Plans for extension were made besides proposals for fund raising. The GA adopted the Statutes and Internal Regulations which will be the guiding point for the CCI India in future. It was also decided to have a legal status for CCI by registering it under the ‘Societies Act’.